Are Surgical Residents Prepared to Care for Transgender Patients? To the Editor In the article “Emergency General Surgery Needs for Lesbian, Gay, Bisexual, and Transgender Patients: Are We Prepared?” Shields et al1 discuss the necessity for competency-based training on sexual orientation and gender identity in surgical encounters. They suggest an initial set of recommendations as adapted from the Fenway Institute and encourage training of students, residents, and staff on inclusive care for lesbian, gay, bisexual, and transgender (LGBT) patients. 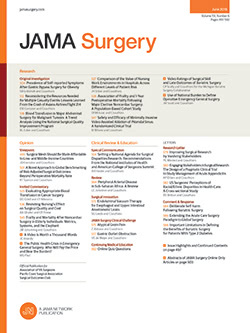 This article opens the discussion on the integration of this training into all surgical specialties, but we think it is important to clarify what current research shows regarding the lack of technical training for surgical care of a subset of the LGBT population: transgender patients.